Ganesh Chaturthi (IAST: Gaṇēśa Chaturthī), also known as Vinayaka Chaturthi (Vināyaka Chaturthī) or Vinayaka Chavithi (Vināyaka Chavithī) is a Hindu festival celebrating the birth of Ganesha. It falls in the months of August or September of the Gregorian calendar. The festival is marked with the installation of Ganesha clay idols privately in homes, or publicly on elaborate pandals (temporary stages). Observations include chanting of Vedic hymns and Hindu texts such as , prayers and vrata (fasting). Offerings and prasadam from the daily prayers, that is distributed from the pandal to the community, include sweets such as modaka as it is believed to be a favorite of Lord Ganesh. The festival ends on the tenth day after start,but we end it by one and a half day where the idol is carried in a public procession with music and group chanting, then immersed in a nearby body of water such as a river or sea. In Mumbai alone, around 150,000 statues are immersed annually. thereafter the clay idol dissolves and Ganesha is believed to return to Mount Kailash to Parvati and Shiva. The festival celebrates Lord Ganesha as the God of New Beginnings and the Remover of Obstacles as well as the god of wisdom and intelligence and is observed throughout India, especially in the states such as Maharashtra, Madhya Pradesh, Karnataka, Goa, Telangana, Gujarat and Chhattisgarh, and is usually celebrated privately at home in states such as Tamil Nadu, and Andhra Pradesh. 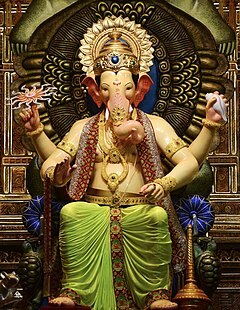 Ganesh Chaturthi is also observed in Nepal and by the Hindu diaspora elsewhere such as in Australia, Canada, Malaysia, Trinidad and Tobago, Guyana, Suriname, other parts of the Caribbean, Fiji, Mauritius, South Africa, United States, and in Europe (in Tenerife). At public venues, along with the reading of texts and group feasting, athletic and martial arts competitions are also held. 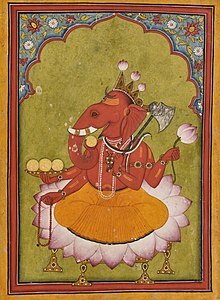 Ganesha, Basohli miniature, circa 1730. It is unclear when the festival started, it became a major social and public event with sponsorship of Chatrapati Shivaji Maharaj after Mughal-Maratha wars, and again in the 19th century after public appeal by Indian freedom fighter Lokmanya Tilak, who championed it as a means to circumvent the colonial British government ban on Hindu gatherings through its anti-public assembly legislation in 1892. The earliest mention of Ganapati, but not referring to the current Ganesha or Vinayaka, is found in the Rigveda. It appears twice in the Rigveda, once in hymn 2.23.1, as well as in hymn 10.112.9. Both of these hymns imply a role of Ganapati as "the seer among the seers, abounding beyond measure in food presiding among the elders and being the lord of invocation", while the hymn in mandala 10 states that without Ganapati "nothing nearby or afar is performed without thee", according to Michael. However, it is uncertain that the Vedic term Ganapati which literally means "guardian of the multitudes", referred specifically to later era Ganesha, nor do the Vedic texts mention Ganesha Chaturthi. appears in post-Vedic texts such as the Grhya Sutras and thereafter ancient Sanskrit texts such as the Vajasaneyi Samhita, the Yajnavalkya Smriti and the Mahabharata mention Ganapati as Ganesvaras and Vinayakas. Ganesha appears in the medieval Puranas in the form of "god of success, obstacle remover". The Skanda Purana, Narada Purana and the Brahma Vaivarta Purana, in particular, profusely praise him. Beyond textual interpretations, archeological and epigraphical evidence suggest Ganesha had become popular, was revered before the 8th century CE and numerous images of him are traceable to the 7th century or earlier. For example, carvings at Hindu, Buddhist and Jain temples such as at the Ellora Caves, dated between the 5th and 8th century show Ganesha reverentially seated with major Hindu goddess(Shakti). Although it is unknown when (or how) Ganesha Chaturthi was first observed, the festival has been publicly celebrated in Pune since the era of Shivaji (1630–1680, founder of the Maratha Empire). After the start of the British Raj, the Ganesha festival lost state patronage and became a private family celebration in Maharashtra until its revival by Indian freedom fighter and social reformer Lokmanya Tilak. I followed with the greatest curiosity crowds who carried in procession an infinite number of idols of the god Ganesh. Each little quarter of the town, each family with its adherents, each little street corner I may almost say, organizes a procession of its own, and the poorest may be seen carrying on a simple plank their little idol or of papier mâché... A crowd, more or less numerous, accompanies the idol, clapping hands and raises cries of joy, while a little orchestra generally precedes the idol. According to others such as Kaur, the festival became a public event later, in 1892 when Bhausaheb Laxman Javale ( also known as Bhau Rangari), installed the first sarvajanik (public) Ganesha idol in Pune. In 1893, the Indian freedom fighter Lokmanya Tilak praised the celebration of sarvajanik Ganesha utsav in his newspaper, Kesari, and dedicated his efforts to launch the annual domestic festival into a large, well-organised public event. Tilak recognized Ganesha's appeal as "the god for everybody", and according to Robert Brown, he chose Ganesha as the god that bridged "the gap between Brahmins and non-Brahmins", thereby building a grassroots unity across them to oppose British colonial rule. According to Richard Cashman, Tilak recruited and passionately committed himself to god Ganesha after the 1893 Hindu-Muslim communal violence in Bombay and the Deccan riots, when he felt that the British India government under Lord Harris had repeatedly taken sides and not treated Hindus fairly because Hindus were not well organized. In Tilak's estimate, Ganesha worship and processions were already popular in rural and urban Hindu populations, across social castes and classes in Baroda, Gwalior, Pune and most of the Maratha region in the 18th century. In 1893, Tilak helped expand Ganesh Chaturthi festival into a mass community event and a hidden means for political activism, intellectual discourse, poetry recitals, plays, concerts, and folk dances. In Goa, Ganesha Chaturthi predates the Kadamba era. The Goa Inquisition had banned Hindu festivals, and Hindus who did not convert to Christianity were severely restricted. However, Hindu Goans continued to practice their religion despite the restrictions. Many families worship Ganesha in the form of patri (leaves used for worshiping Ganesha or other gods), a picture drawn on paper or small silver idols. In some households Ganesha idols are hidden, a feature unique to Ganesh Chaturthi in Goa due to a ban on clay Ganesha idols and festivals by the Jesuits as part of the Inquisition. The Lalbaugcha Raja (the most renowned version of Ganesha in Mumbai) in procession. Public preparations for the festivities begin months in advance. Local Mandapa or Pandal's are usually funded either from donations by local residents or hosted by businesses or community organizations. The making of the Murti in Maharashtra usually begins with "Padya pooja" or worshipping the feet of Lord Ganesh. The Murti's are brought to "pandals" on the day or a day before the festival begins. The pandals have elaborate decoration and lighting. At home, the festival preparation includes purchases such as puja items or accessories a few days in advance and booking the ganesh murti as early as a month beforehand (from local artisans). The murti is brought home either a day before or on the day of the ganesh chaturthi itself. Families decorate a small, clean portion of the house with flowers and other colourful items before installing the idol. When the Murti is installed, it and its shrine are decorated with flowers and other materials. On the day of the festival, The ceremonial installation of the clay murti (idol) is done along with chans of holy mantras and pooja including bhajans during a certain auspicious period of the day. In preparation for the festival, artisans create clay models of Ganesha for sale. The Murti's range in size from 3⁄4 inch (1.9 cm) for homes to over 70 ft (21 m) for large community celebrations. The date for the festival is usually decided by the presence of Chaturthi Thithi. The festival is held during "Bhadrapada Madyahanaa Purvabaddha". If the chaturthi thiti begins at night on previous day and gets over by morning on next day then the next day is observed as vinayaka chaturthi. In the consecration ceremony, a priest performs a Prana Pratishtha to invite Ganesha like a guest. This is followed by the 16-step Shodashopachara ritual, (Sanskrit: Shodash, 16; Upachara, process) during which coconut, jaggery, modaks, durva grass and red hibiscus (Jaswand) flowers are offered to the idol. Depending on the region and timezone, the ceremony commences with hymns from the Rigveda, the Ganapati Atharvashirsa, the Upanishads and the Ganesha stotra (prayer) from the Narada Purana are chanted. In Maharashtra as well as Goa, Aartis are performed with friends and family, typically in the morning and evening. In India, Ganesha Chaturthi is primarily celebrated at home and in public by local community groups in the central and western states of Madhya Pradesh, Maharashtra, Gujarat and Goa and the southern states of Karnataka, Kerala, Andhra Pradesh, Telangana, Tamil Nadu, West Bengal and Eastern states of Odisha. At Varasidhi Vinayaka swamy Temple in Kanipakam, Andhra Pradesh, annual brahmotsavams will be celebrated for 21 days starting from Vinayaka chavithi day. The processional deity of Vinayaka will be taken in a procession on different vahanams on these days amidst large number of pilgrims across the country. At homes in Maharashtra, families install small clay statues for worship during the festival. The Murti is worshiped in the morning and evening with offerings of flowers, durva(strands of young grass), karanji and modaks (jaggery and coconut flakes wrapped in rice flour dumplings). The worship ends with the singing of an aarti in honour of Ganesha, other Gods and Saints. In Maharashtra the Marathi aarti "Sukhakarta Dukhaharta", composed by the 17th century saint, Samarth Ramdas is sung. Family traditions differ about when to end the celebration. Domestic celebrations end after ​1 1⁄2, 3, 5, 7 or 11 days. At that time the Murti is ceremoniously brought to a body of water (such as a lake, river or the sea) for immersion. 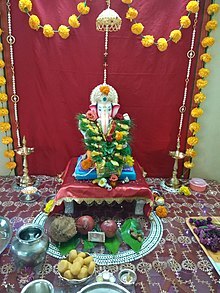 In Maharashtra, Ganeshotsav also incorporates other festivals, namely Hartalika and the Gauri festival, the former is observed with a fast by women on the day before Ganesh Chaturthi whilst the latter by the installation of Murti's of Gauris. In Goa, Ganesh Chaturthi is known as Chavath in Konkani and Parab or Parva ("auspicious celebration"); it begins on the third day of the lunar month of Bhadrapada. On this day Parvati and Shiva are worshiped by women, who fast. Instruments such as ghumots, Crash cymbals (ताळ(taal) in Konkani) and pakhavaj (an Indian barrel-shaped, two-headed drum) are played during the rituals. The harvest festival, Navyachi Pancham, is celebrated the next day; freshly harvested paddy is brought home from the fields (or temples) and a puja is conducted. Communities who ordinarily eat seafood refrain from doing so during the festival. In Karnataka the Gowri festival precedes Ganesha Chaturthi, and people across the state wish each other well. In Andhra Pradesh, Ganesha Murti'so of clay (Matti Vinayakudu) and turmeric (Siddhi Vinayakudu) are usually worshiped at home with plaster of Paris Murti's. Public celebrations of the festival are popular, and are organised by local youth groups, neighborhood associations or groups of tradespeople. Funds for the public festival are collected from members of the association arranging the celebration, local residents and businesses. The Ganesha idols and accompanying statues are installed in temporary shelters, known as mandaps or pandals. The festival features cultural activities such as singing, theater and orchestral performances and community activities such as free medical checkups, blood-donation sites and donations to the poor. Ganesh Chaturthi, in addition to its religious aspects, is an important economic activity in Mumbai, Surat, Pune, Hyderabad, Bangalore and Chennai. Many artists, industries, and businesses earn a significant amount of their living from the festival, which is a stage for budding artists. Members of other religions also participate in the celebration. In Tamil Nadu, the festival, also known as Vinayaka Chaturthi or Pillayar Chaturthi, falls on the fourth day after the new moon in the month of Āvaṇi in the Tamil calendar. The idols are usually made of clay or papier-mâché, since Plaster of Paris idols have been banned by the state government, but violations of this rule are often reported Idols are also made of coconuts and other organic products. They are worshiped for several days in pandals, and immersed in the Bay of Bengal the following Sunday. In Kerala the festival is also known as Lamboodhara Piranalu, which falls in the month of Chingam. In Thiruvananthapuram a procession marches from the Pazhavangadi Ganapathi Temple to Shankumugham Beach, with tall statues of Ganesha made from organic items and milk immersed in the sea. Ganesha Chaturthi is celebrated in the UK by British Hindu population living there. The Hindu Culture and Heritage Society, a Southall-based organisation, celebrated Ganesha Chaturthi for the first time in London in 2005 at the Vishwa Hindu Temple; the idol was immersed in the River Thames at Putney Pier. Another celebration, organised by a Gujarati group, has been celebrated in Southend-on-Sea and attracted an estimated 18,000 devotees. Annual celebrations are also held on the River Mersey in Liverpool. The Philadelphia Ganesha Festival is one of the most popular celebrations of Ganesha Chaturthi in North America, and it is also celebrated in Canada (particularly in the Toronto area), Mauritius, Malaysia and Singapore. The Mauritius festival dates back to 1896, and the Mauritian government has made it a public holiday. In Malaysia and Singapore, the festival is more commonly known as Vinayagar Chaturthi because of the large Tamil-speaking Hindu minority. In Metropolitan France, Ganesh Chaturthee remains the main Hindu religious festival. The first Hindu Temple dedicated to Ganesh on Continental France opened in 1985 and the first procession took place in 1995. Since then, every year, the La Chapelle Quarters of Paris are the sight of a major procession with thousands of pilgrims and visitors. The organisation is mainly conducted by the Tamil speaking Sri Lanka community and the pilgrims are mostly Tamil Hindus from Sri Lanka and to a lesser extent Hindi-speaking Hindus from Mauritius. The primary sweet dish during the festival is modak (modak in Marathi and Konkani, modakam or kudumu in Telugu, modaka or kadubu in Kannada, kozhakatta or modakkam in Malayalam and kozhukattai or modagam in Tamil). A modak is a dumpling made from rice or wheat flour, stuffed with grated coconut, jaggery, dried fruits and other condiments and steamed or fried. Another popular sweet dish is the karanji (karjikai in Kannada), similar to modak in composition and taste but in a semicircular shape. This sweet meal is called Nevri in Goa and is synonymous with Ganesh festival amongst the Goans and the Konkani diaspora. In Andhra Pradesh and Telangana modak, laddu, vundrallu (steamed, coarsely ground rice-flour balls), panakam (a jaggery-, black pepper- and cardamom-flavored drink), vadapappu (soaked moong lentils) and chalividi (a cooked rice flour and jaggery mixture) are offered to Ganesha. These offerings are known as naivedya, and a plate of modak traditionally holds 21 pieces of the sweet. In Goa, modak and a Goan version of idli (sanna) is popular. Panchakajjaya is an offering made to Lord Ganesha during this festival in parts of Karnataka. It is a mixture of desiccated coconut, roasted Bengal gram powder, sugar, ghee and sesame. Different versions of panchakajjaya are made. Roasted Bengal gram, green gram, roasted chana dal (putani) or aval can be used. The Madras High Court ruled in 2004 that immersion of Ganesh idols is unlawful because it incorporates chemicals that pollute the sea water. In Goa the sale of plaster-of-Paris Ganesha idols has been banned by the state government and celebrants are encouraged to buy traditional, artisan-made clay idols. Recent initiatives to produce traditional clay Ganesha idols in Hyderabad have been sponsored by the Andhra Pradesh Pollution Control Board. Due to environmental concerns, a number of families now avoid bodies of water and let the clay statue disintegrate in a barrel of water at home. After a few days, the clay is spread in the garden. In some cities a public, eco-friendly process is used for the immersion. ^ The transformation of Ganesh Chaturthi into a major annual religious and politically significant procession event started in 1894. According to Aslam Syed, the Ganesha statue immersion ritual in the western states of India may have grown because the annual gathering and procession by Shia Muslims on Muharram was allowed by the colonial British government in the 19th and early 20th century, and after the ritual mourning of the death of the 7th century Imam, they would immerse Tazia (Taboots) into river or ocean. The Hindus expanded their own Ganesha processions by walking through the streets, joyfully dancing and reciting their scriptural verses and ended their procession with a ceremonial immersion of Ganesh. The colonial British government attempted to introduce procession license, to Muslims only, which Hindu leaders presented as evidence of discriminatory oppression by the Muslims and the British. The Hindu leaders such as Tilak defied any attempts to selectively stop the Hindu congregational gathering and processions associated with Ganesh Chaturthi. The right to organize processions and immersion rituals of Tazia by Muslims, and Ganesha by Hindus, have remained a religious and equal rights issue ever since, particularly when the religious calendars overlap. ^ a b c timeanddate.com. "Ganesh Chaturthi/Vinayaka Chaturthi in India". Retrieved 12 September 2018. ^ a b Darra Goldstein (2015). The Oxford Companion to Sugar and Sweets. Oxford University Press. pp. 82, 254, 458. ISBN 978-0-19-931361-7. ^ K. T. Achaya (2001). A Historical Dictionary of Indian Food. Oxford University Press. pp. 68–69, 132. ISBN 978-0-19-565868-2. ^ a b Patrick Taylor; Frederick I. Case (2013). The Encyclopedia of Caribbean Religions. University of Illinois Press. p. 332. ISBN 978-0-252-09433-0. ^ Getty 1936, p. 5. ^ Lawrence A. Babb (1975). The Divine Hierarchy: Popular Hinduism in Central India. Columbia University Press. pp. 62–63. ISBN 978-0-231-08387-4. ^ a b c Christian Roy (2005). Traditional Festivals: A Multicultural Encyclopedia. ABC-CLIO. pp. 178–80. ISBN 978-1-57607-089-5. ^ Ramesh Dutt Ramdoyal (1990). Festivals of Mauritius. Editions de l'Océan Indien. pp. 21–22. ^ "Festivals, Cultural Events and Public Holidays in Mauritius". Mauritius Tourism Authority. Archived from the original on 20 January 2012. Retrieved 28 January 2012. ^ "Ganesh Chaturthi - CONCURSO FOTOGRÁFICO: MIGRACIONES INTERNACIONALES Y FRONTERAS". investigacion.cchs.csic.es. ^ Royina Grewal (2009). The Book of Ganesha. Penguin Books. pp. 143–146. ISBN 978-0-14-306760-3. ^ a b Paul B. Courtright (1985). Ganesa. Oxford University Press. pp. 230–37. ISBN 978-0-19-503572-8. ^ a b Trimbak Vishnu Parvate (1958). Bal Gangadhar Tilak: A Narrative and Interpretative Review of His Life, Career and Contemporary Events. Navajivan. pp. 96–102. ^ Sohoni, Ashutosh (2011). "Ganesh Temple at Tasgaon: Apotheosis of Maratha Temple Architecture". South Asian Studies. Informa UK Limited. 27 (1): 51–73. doi:10.1080/02666030.2011.556011. ^ a b Michael 1983, pp. 99–102. ^ Cite error: The named reference rv2231 was invoked but never defined (see the help page). ^ Michael 1983, pp. 107–09. ^ Michael 1983, pp. 109–10. ^ a b c Kapoor, Subodh. The Indian Encyclopaedia. Cosmo Publications. p. 2514. ISBN 978-81-7755-257-7. ^ Richard I. Cashman (1975). The Myth of the Lokamanya Tilak and Mass Politics in Maharashtra. University of California Press. p. 76. ISBN 978-0-520-02407-6. ^ Robin Jeffrey (1990). India: rebellion to republic, selected writings 1857–1990. Stirling. pp. 40–41. ISBN 978-8120711075. ^ Kaur, R. (2003). Performative politics and the cultures of Hinduism: Public uses of religion in western India. Anthem Press, pp. 38–48. ^ Metcalf, Thomas R.; Metcalf, Barbara Daly. A Concise History of India. ISBN 0-521-63027-4. , Metcalf and Metcalf, p. 150. ^ Momin, A.R., The Legacy of G. S. Ghurye: A Centennial Festschrift, p. 95. ^ Brown, Robert L. (1991). Ganesh: Studies of an Asian God. Albany: State University of New York. p. 9. ISBN 0-7914-0657-1. ^ For Tilak as the first to use large public images in maṇḍapas (pavilions or tents) see: Thapan, p. 225. Thapan, Anita Raina (1997). Understanding Gaņapati: Insights into the Dynamics of a Cult. New Delhi: Manohar Publishers. ISBN 81-7304-195-4. ^ a b Aslam Syed (2014). David Jones; Michele Marion (eds.). The Dynamics of Cultural Counterpoint in Asian Studies. SUNY Press. pp. 97–98. ISBN 978-1-4384-5191-6. ^ Shabnum Tejani (2008). Indian Secularism: A Social and Intellectual History, 1890–1950. Indiana University Press. pp. 58–61. ISBN 0-253-22044-0. ^ HC's 2-hour immersion breather for home Pujas The Times of India (7 October 2016). ^ Peter van der Veer (2015). Handbook of Religion and the Asian City: Aspiration and Urbanization in the Twenty-First Century. University of California Press. pp. 95–100. ISBN 978-0-520-96108-1. ^ Richard I. Cashman (1975). The Myth of the Lokamanya Tilak and Mass Politics in Maharashtra. University of California Press. p. 75 with footnote 1. ISBN 978-0-520-02407-6. ^ Richard I. Cashman (1975). The Myth of the Lokamanya Tilak and Mass Politics in Maharashtra. University of California Press. pp. 70–73. ISBN 978-0-520-02407-6. ^ Richard I. Cashman (1975). The Myth of the Lokamanya Tilak and Mass Politics in Maharashtra. University of California Press. pp. 75–77. ISBN 978-0-520-02407-6. ^ Cashman, Richard I. (1975). The Myth of the Lokamanya Tilak and Mass Politics in Maharashtra. Berkeley and Los Angeles, California: University of California Press. pp. 75–91. ISBN 0-520-02407-9. ^ "Andhra laddu-maker eyes to break own Guinness Record with 8000 kg laddu". Daily News and Analysis India. Daily News and Analysis India. 16 September 2015. Retrieved 25 September 2015. ... ready for delivery tomorrow to an 80-feet tall Ganesha Murti put up by Visakha Integrated Social Welfare Association supported by NRIs at the Gajuwaka area in Visakhapatnam. ^ "Rituals Explained". thehindutemple.org. Retrieved 21 September 2015. ^ Kolte, R.R., Kulkarni, R.S., Shinde, P.V., Padvekar, H.K., Magadum, V.G. and Apate, S.A., Studies on the ethno-medicinal plants used on the occasion of festivals with special reference to Ratnagiri district from Maharashtra state . ^ "All set for Kanipakam temple fest". The Hans India. 4 September 2016. Retrieved 7 September 2018. ^ "Ganesh Chaturthi Festival Guide". ^ "What is the significance of 'durva' in Ganesh Poojan ?". sanatan.org/. Retrieved 3 January 2015. ^ Sharma, Usha (2008). Festivals In Indian Society (2 Vols. Set). New Delhi: Mittal publications. p. 144. ISBN 81-8324-113-1. ^ Shanbag, Arun (2007). Prarthana: A Book of Hindu Psalms. Arlington, MA: Arun Shanbag. p. 163. ISBN 978-0-9790081-0-8. ^ Pattanaik, Devdutt (2011). 99 thoughts on Ganesha : [stories, symbols and rituals of India's beloved elephant-headed deity]. Mumbai: Jaico Pub House. p. 61. ISBN 978-81-8495-152-3. Retrieved 29 August 2016. ^ a b "Ganesh Chaturhi or Chovoth". goatourism.gov.in. Government of Goa. Retrieved 23 August 2014. ^ Singbal, Anwesha. "Bringing the local beat back". thegoan.net/. The Goan. Archived from the original on 26 August 2014. Retrieved 23 August 2014. ^ Courtright, P.B. (1988). "The Ganesh Festival in Maharashtra: Some Observations". The Experience of Hinduism: Essays on Religion in Maharashtra, 84–86. ^ "Kolhapur Muslims mark Ganesha festival with Hindu brothers in mosque". Oneindia. Retrieved 9 September 2015. ^ "Hindu, Muslim families celebrate Ganesh Puja". India Today. Headlines Today. 24 August 2009. Retrieved 9 September 2015. ^ "Idol makers in Madurai take to eco-friendly Ganeshas". The Times of India. Retrieved 11 September 2018. ^ "Govt order on rules for Ganesh Chathurthi not violative of rights, says Madras HC". The News Minute. 6 September 2018. Retrieved 11 September 2018. ^ "Raid against idols made of plaster of paris". The Times of India. Retrieved 11 September 2018. ^ "Ganesh Chaturthi Pooja Rituals". ganeshchaturthigifts.com. ^ "Thousands turn out for Hindu Festival at Shoebury East Beach". Southend Standard. 1 September 2009. Retrieved 25 September 2015. It is thought as many as 18,000 people attended from across Essex, Kent, Middlesex, London, the Midlands and even India. ^ "River marks religious ceremony". bbc.co.uk. BBC News. ^ "Liverpool Echo: Latest Liverpool and Merseyside news, sports and what's on". liverpoolecho. ^ Kalyana Ramanathan; Indira Kannan (11 September 2010). "Non-resident gods". Business Standard. Retrieved 14 October 2015. ^ "Mauritius takes the day off for Ganesh Chaturthi". aglobalworld.com. Retrieved 29 May 2017. ^ Patrick Eisenlohr (2006). Little India: Diaspora, Time, and Ethnolinguistic Belonging in Hindu Mauritius. University of California Press. p. 153. ISBN 9780520248793. Retrieved 14 October 2015. ^ "Hindus celebrate Vinayagar Chathurthi". The Malaysian Times. 9 September 2013. Retrieved 14 October 2015. ^ Gazetteer of the Union Territory Goa, Daman and Diu: district gazetteer, Volume 1. Goa, Daman and Diu (India). Gazetteer Dept. 1979. p. 258. ^ Ferro-Luzzi, G.E., 1977. "The logic of South Indian food offerings". Anthropos, (H. 3./4), pp. 529–56. ^ "Ganesha immersions ruled unlawful". bbc.co.uk. BBC News – South Asia. ^ Special Correspondent. "Goa bans plaster of Paris Ganesha idols". The Hindu. ^ Editor. "The Environmentally Friendly Ganesh". chakranews.com. ^ "Ganesha immersion: temple's awareness campaign finds many takers". The Hindu. ^ Zha, Bagish K. (20 September 2013). "Eco-friendly 'Ganesh Visarjan' save water and soil from getting polluted in Indore". The Times of India. Retrieved 12 February 2014. Michael, S. M. (1983). "The Origin of the Ganapati Cult". Asian Folklore Studies. 42 (1): 91–116. doi:10.2307/1178368. Wikimedia Commons has media related to Ganesh Chaturthi.